Preheat oven to 325 degrees. Butter and flour a 9 by 2-inch spring form pan. If you don’t have a spring form pan, then just use your round 9 by 2-inch pan. 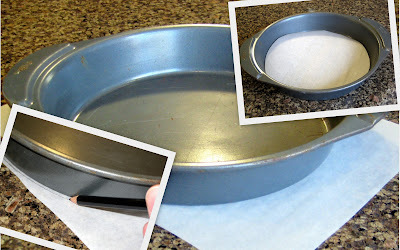 After greasing pan, stick a sheet of parchment paper to the bottom of the pan so you can take the cake out easily (like demonstrated below). Put the chocolate, butter, and salt in a large microwave safe bowl. Melt in the microwave for 2 minutes. Stir and microwave again until completely melted, about 2 more minutes. Alternatively, put the chocolate and butter in a heatproof bowl. Bring a saucepan filled with an inch or so of water to a very slow simmer; set the bowl on the pan without touching the water. Stir occasionally until melted. Beat the eggs and sugar with a standing or handheld mixer until light and thickened. It should appear like this. Your not whipping the eggs completely, just getting them fluffy. Fold the melted chocolate into the whipped eggs until evenly combined. You will want to do this slowly and while continuously stirring to temper the eggs without cooking them. Pour the batter into the prepared pan and bake until a toothpick inserted into the center comes out wet but not gooey, about 1 hour to 1 hour 25 minutes. Remove cake from the oven and cool on a rack. Warning, the cake will probably crack on the top, so don’t worry. You didn’t do anything wrong. In a medium size bowl, whip heavy cream until firm. You want to whip the cream more then you usually would because the raspberries will soften the cream back to preferred texture. In a small bowl, use a fork and mash up the raspberries until no large pieces remain. Add 3 tablespoons of sugar. Slowly fold raspberry sugar mixture to whipped cream a little at a time. Fresh raspberries can be a little tarter then frozen raspberries so taste and add more sugar to the cream as needed. When ready to serve remove from spring form mold. Dust cake with confectioners’ sugar or cocoa powder if desired. Serve with whipped cream or vanilla ice cream would be super yummy with this cake as well.